“Grump!” said the Grumblie. When Jessie went to bed, everything was great; but when Jessie woke up, everything was GRUMPY! You try getting ready for school with a great big Grumblie in your way that only you can see. And, it keeps growing bigger and bigger! Grappling with the Grumblies is the first book in a series of fun-loving stories aimed at empowering children when they feel overwhelmed by negative emotions. Our whole family LOVES this book and we reference it all the time if one of us is acting grumpy--we are able to name and give a big, purple face to those feelings and behaviours, making more room to welcome cheeriness and fun. My kids love to act out all of the different ways to get rid of the grumbly, and love even more to make up new ways to send it away! Young or old, we can all relate to those days when the Grumblies take over. I love how this book demystifies anger, and helps a parent and child to find a way through the tantrums to laughter and light. The writing and illustrations are whimsical, charming and very funny. I can't recommend it highly enough! WOW what a great book! My daughter loves it and wants me to read it over and over again. It's a very sweet book that talks about how to deal with being grumpy. Lovely illustrations and beautiful, poetic writing. A keeper for sure! My son brought this book home from his school library and we just adore it! We love the fun word play and the lively illustrations, as well as the important lessons about dealing with our grumpy moods. Now when he is grumpy I just look at him and say, "Grump?" and he laughs and says, "GRUMP!" and we can let go of whatever was bothering us. What a delightful book with some wonderful lessons for us all. Now it's our favourite book to give as a gift to those we love! I have purchased several copies of this book and given them away to friends and family with small children. I think it's delightful, warmly written and I love the accompanying illustrations. 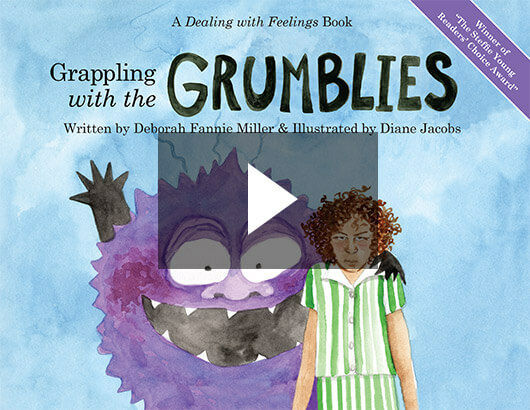 Grappling with the Grumblies is a playful picture book, which takes the frustration that young children often feel and literally turns it into a “Grumblie," a little purple fur ball which grows bigger as the child’s frustration grows. The simple, wise text teaches the child that their anger is something separate from themselves that they can observe and relieve. The beautiful watercolor illustrations delightfully mirror the humor and dynamism of the words. This is a perfect book for parents to read to a child who is having trouble dealing with negative emotions. Finally...a kids book that deals with real issues. Found this to be an excellent book for my (sometimes) grumpy 7 year old daughter. We both enjoy reading it together. Would recommend for anyone with kids. A wonderful, psychologically acute book about dealing with the grumblies, personified here as a truly grumpy purple presence. Fun to read, and a good start to an adult-child discussion about working through a bad mood. Beautiful, dynamic artwork. In playful, inviting language this author invites us into the mind of the angry frustrated child and suggests enjoyable solutions that really do dissolve the 'grumbles'. It's so nice to get answers in a beautifully illustrated and compelling children's story! This my grandchildren's' favourite book!! This is a wonderful book. I recommend it to all my friends who have young children. The story is such FUN. Kids love joining in with the story. It is amazing how a bad mood can take over a child's perspective. This book shows ways of shifting onto a positive outlook. Grappling with the Grumblies is the charming story - told from the grumbly child’s point of view - about how hard it can be to get up in the morning. The story’s prose is beautifully illustrated with watercolor pictures, which bring it to life. In the end, both mother and child find a way to drive the grumblies away together, turning a difficult morning into a marvelous beginning to a new day. A wonderful roadmap for anyone with children who have the grumblies in the morning. Diane Jacobs illustrated Grappling with the Grumblies. Her art works are in collections of the Getty Museum, the New York Public Library, and the San Francisco Museum of Modern Art.